Today, Jagannath Ratha Yatra is held around the world – the most famous being the one held at Puri in Odisha, India. Devotees find ecstasy in pulling the chariots of Jagannath, Balabhadra, and Subhadra. But have you ever wondered about the origin of Rath Yatra? There is a story regarding the origin of Jagannath Ratha Yatra and it is associated with Radha. Sri Krishna had shifted to Dwarka and had happily settled there with his followers. Years later a Surya Grahan, or Total Solar Eclipse, was to take place. Sri Krishna decided to visit the Panchak Tirth in Kurukshetra and perform Snan (holy bath), Upvas (fasting) and Daan (charity). The news of the arrival of Sri Krishna at Kurukshetra reached the ears of Radha. She along with other residents of Vrindavan decided to visit Kurukshetra and have darshan of Sri Krishna. Radha and the Gopis were emotionally overwhelmed on meeting Krishna. They invited him to visit Vrindavan. Krishna accepted the invitation and sat on his chariot along with Balarama and Subhadra to move towards Vrindavan. The joy of the people of Braj was beyond description. Some of them united the horses in front of the chariot and started pulling the chariot. On seeing this, other people joined in pulling the chariot. While pulling, the residents of Braj started shouting Jai Jagannath. This was the first time Sri Krishna was called the Lord of the Universe. Sri Krishna then told the people that as they have become his horses, they could take him wherever they want. It is believed that those who get the opportunity pull the chariot of Jagannath, Balabhadra and Subhadra will attain moksha – escape from the cycle of birth and death. Thus, the first Rath Yatra took place in the Dwapar Yuga when Sri Krishna was still present on earth. After this, Rath Yatra became an important event for Krishna devotees. 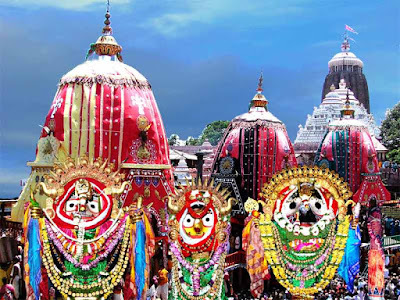 The present form of Jagannath Rath Yatra was popularized by the Puri Jagannath Temple and its devotees. In the 20th century, Srila Prabhupada and ISKCON organization took the Ratha Yatra to all the continents on earth. Today, the annual chariot festival is an important event for Krishna devotees in many cities and towns around the world.